I have been asked many questions about predicting the weather and swell by competitors attending the KSP wave kiting event here in Pacasmayo. The following is an attempt to answer those questions. The information and advice is based off realtime observations, watching the weather, talking to locals and reading forecasts over the last 2 months. If anyone can provide further insight into wind forecasting in Peru, I am interested in hearing from you. Please leave a message in the comments section if you have something to say or if this post has helped you in some way. One of the challenges about kitesurfing in a new place, is being able to read the weather like a local. I really try to understand how accurate weather forecasting is in a particular area. The long-term Peruvian wind forecasts are probably the worst I have encountered in the last 7 months of travelling to France, Sardinia, Brazil and Morocco. I almost didn’t come to Pacasmayo because of low wind forecasts , but have been pleasantly surprised that there is usually 12- 25 knots if the sun is shining. Because the waves in Peru often originate from such a long distance (15-20 sec period), wave forecasting is usually predictable a week out. Locals I have talked to look more at the swell period (15 sec+) rather than height to predict when the good swell will arrive. Magic Seaweed or Windguru are both reliable sites for wave forecasting. The most reliable real-time source of wind information is the weather sensor in Chiclayo. This sensor provides a good indication of what is happening in Pacasmayo, despite being 50km away and inland. Wind Alert provides the easiest to understand wind stats and historical data from this sensor. If you want to see the raw data it can also be found on the NOAA website (select Peru and Chiclayo). Dewpoint and temperature are the most interesting as explained below. Wind forecasting in Peru is so erratic that I have given up trusting the long-range forecasts. Predictwind and Windguru are, however, your best sources of information and are usually more accurate on the day, providing the sun is shining. All the sites I have been following are particularly poor at predicting the cloud cover which might account for the erratic forecasts. 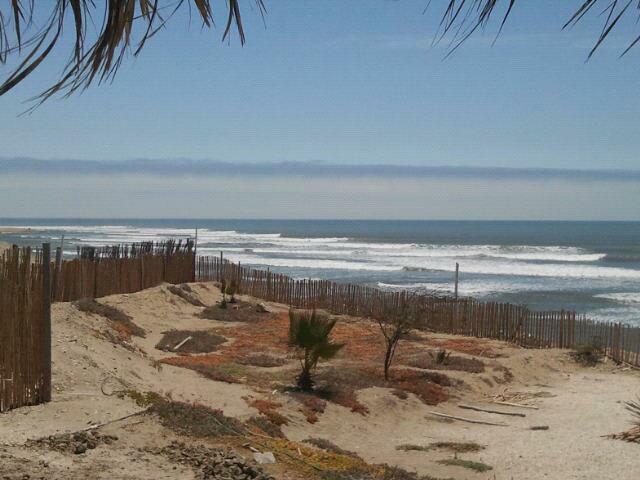 In Pacasmayo the wind blows more cross-shore in the morning and early afternoon swings to more cross off. The time at which the wind swings and peaks, can vary anywhere between 1-5pm. Often the best sessions are late afternoon after the wind has swung more cross off . Look for the high period days of 15 seconds or more. Good for real-time and historical information, but don’t trust the forecasts. Look for the wind angle to be 180 or less and 20mph+ for a good session. Wind becomes more cross offshore and it’s easier to get upwind at angles of 180 or less. Add roughly 30% or more onto figures that Windguru predicts. If the day is cloudy then the raw figures will be correct and it is time to go surfing instead of kiting. Any swell over 2-3 m with a 15+ second period will be the longest rides of your life! Good for real-time wind, temperature and dew point readings. For those that want to get more technical and detailed view of what is happening, this is your source. Dew point is critical when it comes to forecasting fog that is likely to kill the wind. Fog is likely when the surface air temperature and dew point temperature are the same. Dew point is however different from humidity as this article explains. PredictWind is one of my favorite sites because it uses two independent weather models to predict the weather. Comparing the PredictWind forecasts (GFS or CMC) can give you confidence in the forecast. If CMC and GFS models are showing the same numbers then the forecast is more reliable. Thanks to Ariana for putting this Kiteworld article together. It has been a long time coming but here it is, for those that haven’t seen it yet. 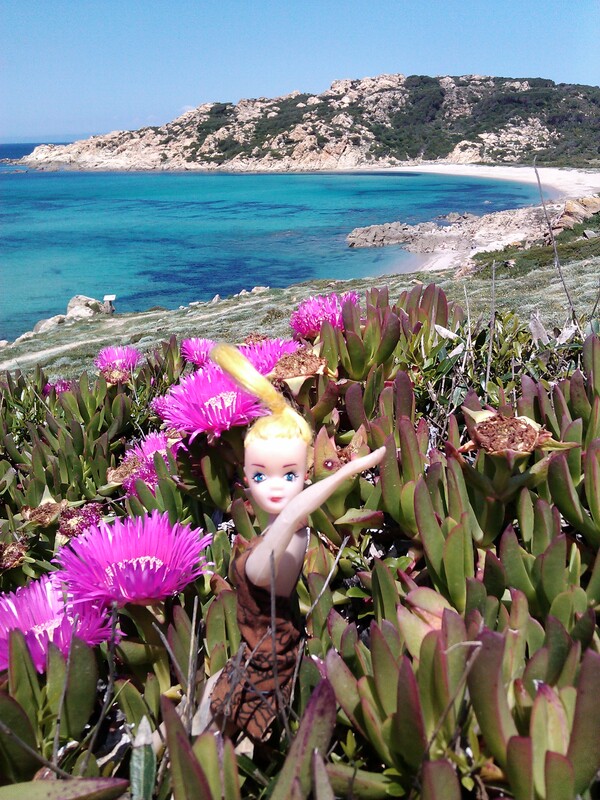 The journey continues but my time travelling and kiting around France, Sardinia and Morocco is almost done. Next, its time to start booking flights as I turn my attention to South America. I’m being lured by the waves and wind in Northern Peru, and the fresh powdery snow on the volcano peaks of Chile are making me drool over some potential snowkiting. I’m finding it tough to get reliable information about snowkiting in Chile and Argentina so if anybody can point me in the right direction then that would be great! I also really want to go back to Brazil, which may seem crazy after all the time I spent there last year, but I have some unfinished business to do. While rushing through my 2000km world record I passed by what looked like some of the most pristine, untouched kite beaches that offered both flat water and wave riding options. They are what I call my secret spots (and yes I am keeping them a secret for now), while I pull together some ideas about potentially sharing these locations with others through a new business venture which will offer a very different kite holiday compared to the current downwinder between Fortaleza and Jeri option. 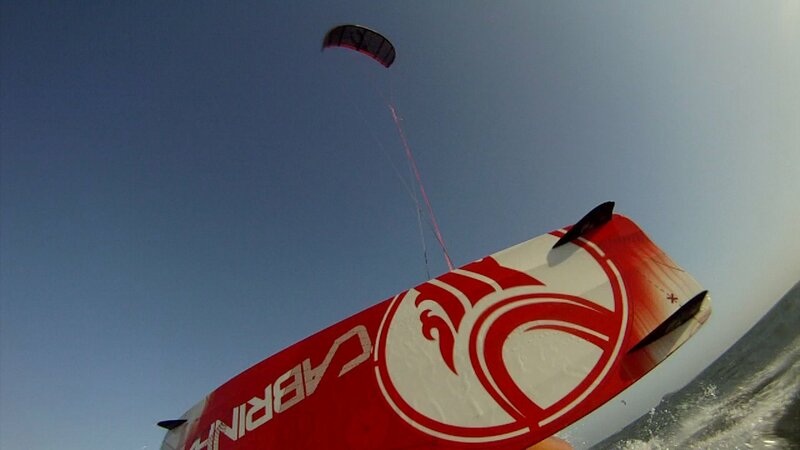 I am however looking for some kite guinea pigs who might want to help share the adventure with me, so if you are an advanced kitesurfer and in Brazil during August or November then drop me a note. 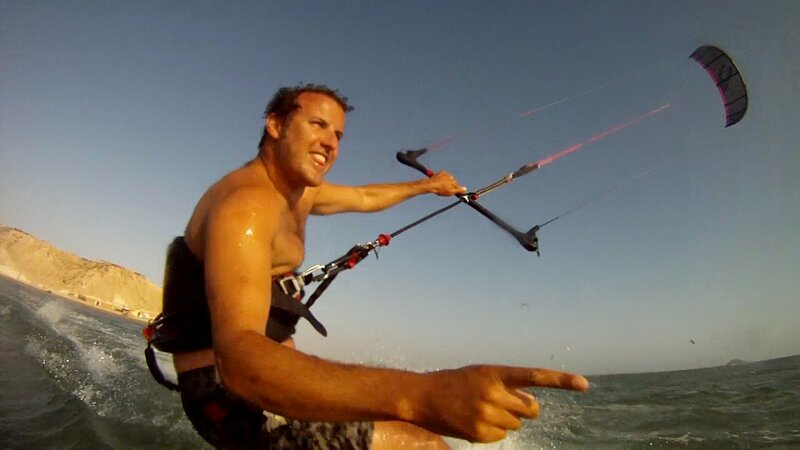 Also if you have a well run Pousada or accommodation service north of Fortaleza or provide kite services or downwind trips in Brazil or Peru then I am also looking for partners and can help promote your services, just leave a comment below. I met Hendri in Uganda 4 years ago when he was training for the first solo descent of the Murchison falls section of the White Nile. Solo trips from Nile River Explores down to the Hairy Lemon island were standard training runs for Hendri at the time. He was somewhat of a legend in the area after leading the first source to sea trip of the White Nile. A few of us kiwis were asked if we wanted to Join Hendri on a road trip to Murchison Falls to help start his solo adventure. The departure time was early sometime around 5am as we packed ourselves into the van. Half asleep I was struggling to close the back boot of the van and Hendri quips ” I wouldn’t rely on you in an emergency in a warzone”. In my half asleep state I thought to myself, I would love to prove you wrong one day. As we unpacked at the get in for the start of Henrys’ paddle there was a surreal sense of will we see this guy again? The odds weren’t in his favour given the stats. The highest concentration of Hippos and Crocs in Africa, 3 rebel groups, including the Lords resistance Army… oh and did I mention that it was also solid class 4/5 whitewater and solo? My question about what he thought the risks were, met with a “no comment”. Perhaps in that moment it set my benchmark for risky which I would later compare my own adventures to. Part of me is like, well kiting solo can’t be so bad, at least I don’t have to worry about Hippos and Crocs. Hendi himself was to comment in one of his posts that he was surprised to make 30 and what that entailed. Thankfully he was successful in completing the trip in 2 days, something that have taken other teams at least 4 days. We greeted him at the take-out above the spectacular Murchison Falls. “Hendi where’s your helmet? Oh, I had to feed to the crocs. I got charged by 7 times on the trip, the last one got a bit close so I threw my helmet at the croc to distract it and paddled off” The conversation followed all night by a very understated “Did I tell you how brave I was?”. I truth, none of us could really understand and certainly one of the things I was later to appreciate on my own Solo trip. I have met plenty of dirt bag kayakers travelling the world and making their money off the river. There was something different about him that I was only to understand later after reading the few Facebook notes he had written about a trip into the heart of Congo. Articulate and intelligent, not your usual deadhead kayaker. Not concerned about fame or fortune but in search of the “Best Day Ever” (BDE). Before you write off the BDE as some sort of hedonist pursuit, it’s actually more of a time worn philosophy which I am only just realising now. But the best day ever (BDE) is not just a saying, it is a philosophy. The need for the best day ever was born out of the simple premises that it is impossible to ever life in any other day than today. Yesterday did exist and it will have a influence on today. But no matter how good yesterday was, come today it’s just another memory gathering dust, its bright colors either being distorted to fit your needs, or fading with ever passing minute. Tomorrow will always be a day away. Its dreams and hopes just like memories, nothing but mental constructs. Bringing us… today. I do not propose that you live everyday as if it will be your last. My personal experience living that theory was disappointing, as it left me very unprepared for reaching, beyond all my expectations, my 30s. In fact for tomorrow to be the best day ever, it has to be built on today, how else could it be better, if today did not serve as a stepping stone for an even better day tomorrow. One might be tempted to call my theory “the best day yet”, but this could imply than one is waiting for a better tomorrow, which is counter to what BDE stands for. I hope it will become clear soon enough. raining when it supposed to be sunny. Do your best in your day. in a day, than you ever will fight physically in a life time. you recognize the challenges and except them, even if there is no reward. Its about giving yourself an opportunity to do something worth remembering, even if its just for a few minutes at night as you drift of to sleep, perhaps just one little thing to help you make tomorrow the BDE. Today, yesterday and tomorrow are not in competition. Taste that meal like it’s the first time you have tasted it, enjoy something as if you have never enjoyed it before and you will have the best day ever. Appreciate what is given to you in your day and it becomes the BDE. Its not about winning, its not about recognition, it about living in the moment, good or bad, feel it, lap it up, good or bad, its all a miracle in some way. So how do you live in the now? By realizing that you are god, that everything that is happing is happening to you. The universe is infinite, making you the centre no matter where you stand. How do you come to the understanding that you are god? By making a difference in your life, by realizing that everything you do has consequences. By taking control of your life, the realization grows in you; I am the one who drives my universe. Don’t expect it to be easy, you will have learnt nothing if it was, the better you become at driving your universe the bigger the challenges will become but the stronger you will be to handle them. Why then all this struggle if all that awaits is more struggle? Because the more you fight the good fight, the clearer you see that external factors are subject to your perspective of them. You can choose not to drive your universe, inside you the spark will die, and your appreciation for life with it, because without that spark, life is not worth living. One of the things that has held me back from learning paragliding up until now has been a question: am I going to get enough out of this sport for the amount of risk involved? I assess IT risk for a living and is something that I also talk about in my Brazil presentation. I talk about the familiar risks or things that we perceive we have control over that often gets us into trouble. The first thing I look at when trying a new risky sport, is the accident statistics. It’s not that I want to freak myself out, but it’s more to understand what mistakes people commonly make and how I can reduce my risk. Ok, you might be thinking this is a bit of a morbid or geeky thing to do. Accident statistics and discussions, however, help everyone continue to learn from the experiences of others, and to constantly question peoples’ own perception of how much of a commitment to safety they are willing to make. To give you an example, as a whitewater kayaker, I actively follow the accident statistics in this sport. 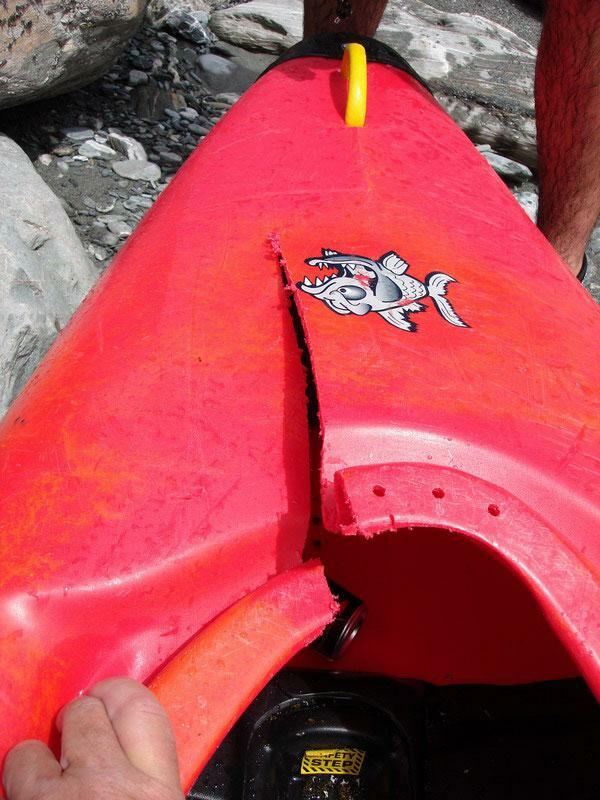 One statistic which stands out, is that half of all white water kayakers killed are a result of being pinned on wood. I used to get a ribbing about carrying a pruning saw kayaking. People would comment “who do you think you are Crocodile Dundee” or “why do you need something like that”. Well, they were not asking the same question after incident on the Whataroa, where a pruning saw was vital to cutting open kayak and saving a life after being pinned by wood. I have thought for some time that the kitesurfing community could learn from paragliding. For a start there are really good yearly accident statistics, in addition to the safety and mindset being emphasised. I’m not trying to imply that kitesurf instructors are doing a bad job or that kitesurfing is unsafe. However, the best we have in the kitesurfing community are statistics from pre 2004. The gear in kitesurfing has become much safer and easier to use after these statistics were gathered, but did it really make us safer in our attitude? 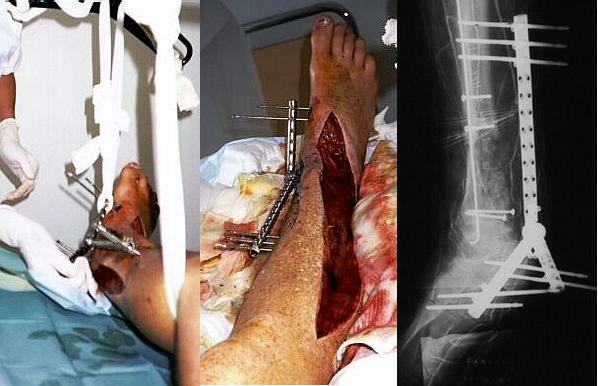 I have always maintained that mountain biking is far more dangerous than kitesurfing , but have never been able to prove it. “More skill gives you a higher limit, as does more experience or better equipment. But safety is not a function of how high your limits are, but rather of how well you stay within those limits. And that is determined by one thing: the quality of the decisions you make”. As with kitesurfing, launch and landings are the most critical moments where people seem to come unstuck in paragliding. The decision-making process does start well before you decide to get on the water to kitesurf, on a river to kayak or in the air to paraglide. I am at the stage of making small (100m) flights after running down the hill. Now I am ready for a longer flight, but unfortunately the weather hasn’t co-operated for the last 2 days of the course. I am now researching other areas where I can learn cost effectively. My criteria for locations are consistent wind and high amount of flying days. An instructor who speaks good English, is safe and enables me to progress efficiently to a fully competent level are high on the list. If there is kitesurfing nearby for the windy days then that is a bonus. So here is my honest opinion on the Alto Paraglide school where I have been learning to paraglide. The school is run by experienced and safety conscious people who also provide good kit to learn with. Alto also has a nice family atmosphere and I was lucky to have good competent fellow students who didn’t hold back the progression. Unfortunately English spoken by the instructor wasn’t what I was hoping for. We did get there in the end with a bit of translation, but it was not ideal. Pierre who runs the school, does have good enough English and is a very experienced pilot. If Alto were able to offer good English-speaking instructors, then I would have no hesitation in recommending them in the future to English-speaking people. 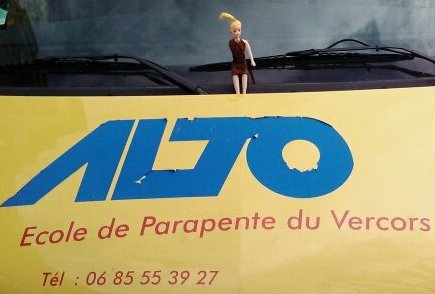 If your French is good, I would have no hesitation in learning to paraglide at Alto. Have you ever lived somewhere or gone on holiday and been frustrated by the weather conditions? If you have ever lived in Wellington NZ you may will have been frustrated by how windy it is. Fair call, it really is one of the windiest cities in the world, the stats say so. You probably start asking your self questions like why it’s so windy and continue to get frustrated unless you are into sailing or kitesurfing. Over 3.5 half years ago I was frustrated by having to drive 3-8 hours each weekend to get good kayaking. Rather than get frustrated I asked myself the question, what can I do right here in Wellington NZ, that will keep me entertained and give me Flow . Bingo, it is windy in Wellington and kitesurfing looks good. Over 3.5 years have passed and a world record later, I am here in France chasing snow kiting. I have arrived at the end of a bad snow season, with beautiful blue skys, 20-25 degrees and perfectly still wind conditions. Now that sounds pretty good if you enjoy summer, but not if you are a snow kiter. 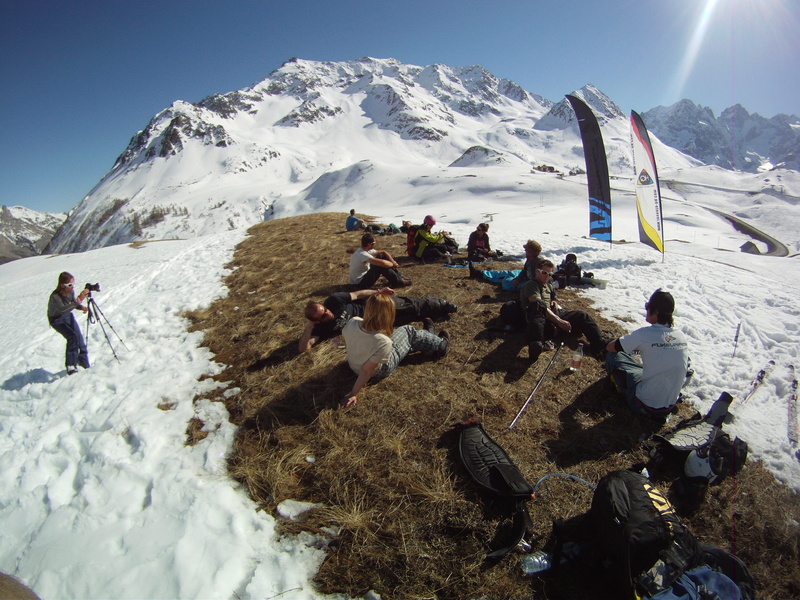 I have spent over a week up at the Col du Lautaret and unfortunately only managed one half day of snow kiting. 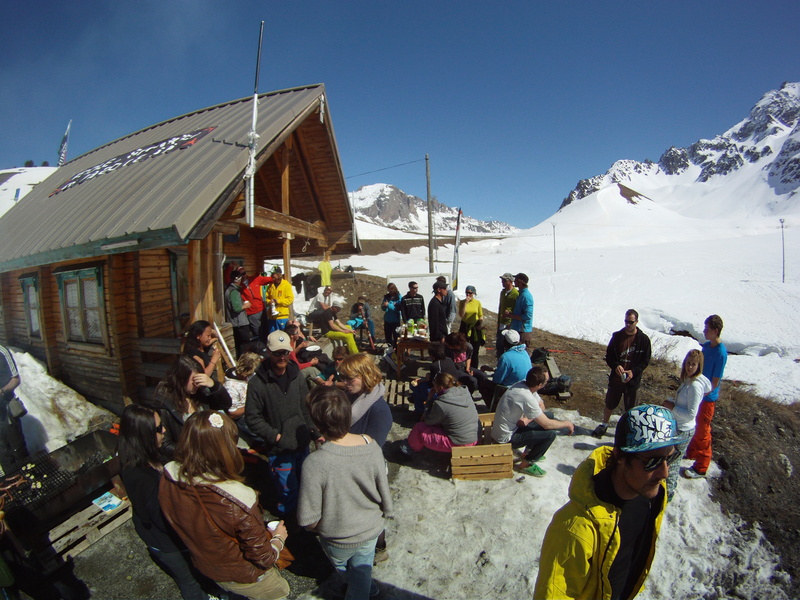 I have however managed to meet some cool people up there and been hosted by The Kite Legende snow kite school . Great bunch of guys and a fantastic spot with good access. If you are ever in the area do look up Rémi Borgioli, he runs Frances oldest kite school, has good English, is an all round nice guy and has good knowledge of the weather. So I am back in Lans en Vercors (Close to Grenoble) and am asking myself the same question as 3.5 years ago. 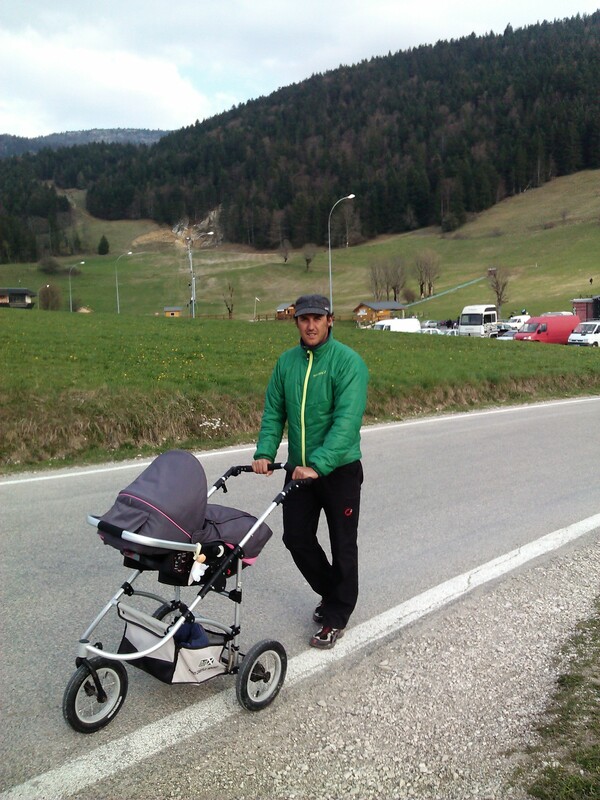 What can I do in Lans en Vercors that can take advantage of the nice weather stunning scenery and that also lets me perform baby minding duties. You have probably guessed from the title that it’s paragliding. The idea has been eating away at me for some time now and was cemented but watching Dave Cornthwaite learning to paraglide. He has a great blog and an interesting series of adventures planned. Go check his blog out. I have chosen to learn to paraglide with Parapente Alto who has been operating since 1995 and has a good safety record. My main concern was to find someone who can speak English, because I really am not keen on a lost in translation moment, while hanging from a bit of cloth, a few strings and dangling hundreds of feet up in the air. Thankfully they do have instructors that speak good English. We we, was that left or right you wanted me to go? 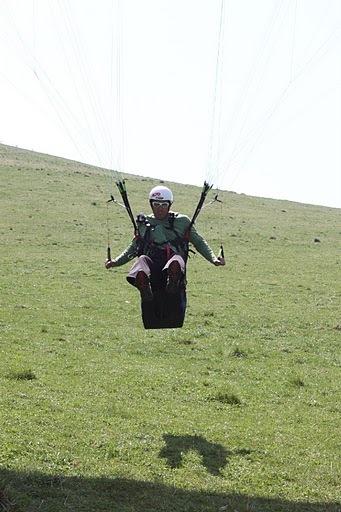 My next few blogs will be about the adventure of learning to Paraglide. I hope to be able to provide an insight into what its like and what I am thinking along the way. This will be an honest warts and all account. As a full disclosure I have been tandem paragliding passenger twice with my cousin, who runs Coronet Peak Tandems. 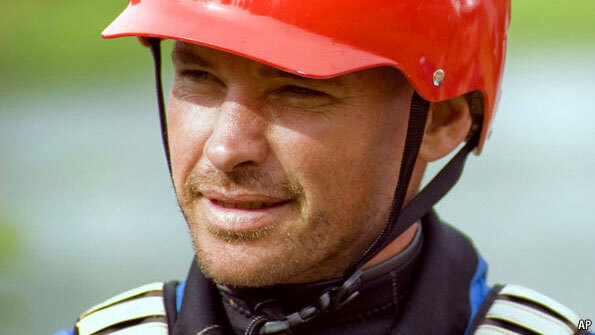 He is based Queenstown NZ and has in the past has been the best performing kiwi on the world cup paragliding circuit, as well as 4 times NZ champion. Other than that I have no experience of paragliding other that being related to someone really good at the sport. What have you thought about wanting to try, but never got around to it? There are plenty of ways to travel 2000 kms in comfort, safety and speed. Riding ocean waves on a board smaller than an ironing table holding a kite is not one of them. 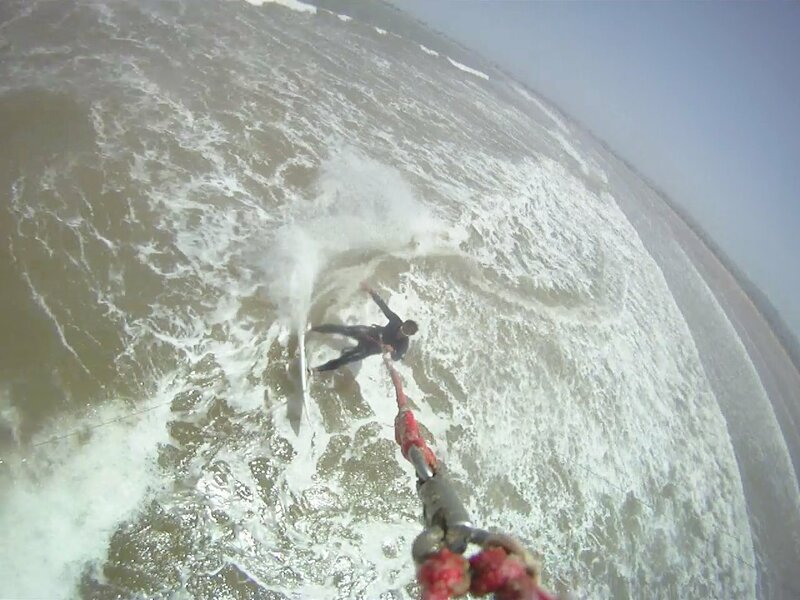 So what was Louis Tapper thinking when he made the world record attempt – kite-surfing solo 2000kms of Brazilian coastline? And more importantly – how did he turn this dream into a reality? 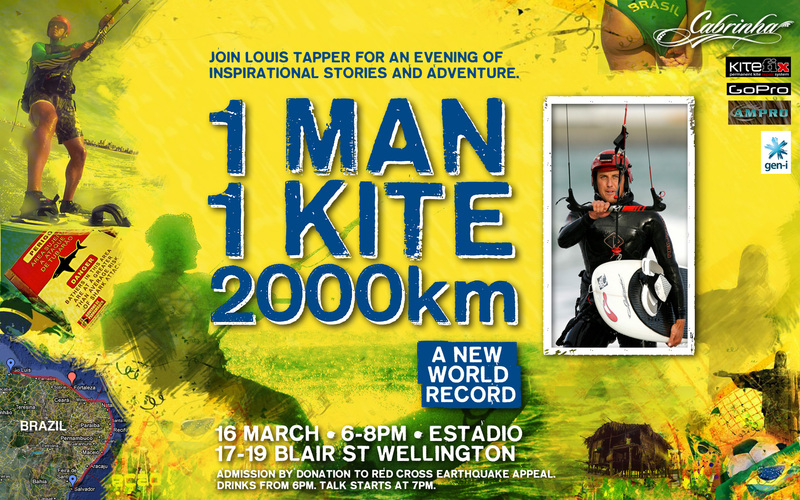 Whether you are a kite-surfer or not, you want to discover Louis’ method, and use it to realise your own goals, or you just want to have a great evening with a friend listening to an inspiring story – you’ll not want to miss this event. When: 16 March. Social drinks from 6pm, presentation starts at 7pm. Admission by $10 donation to Red Cross earthquake appeal.